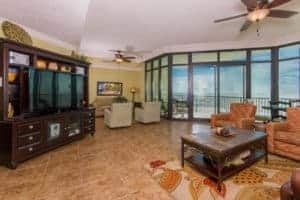 When you envision a beach condo do you think about palm trees, bright colors and Jimmy Buffet’s “Margaritaville?” Times have changed, styles have changed and this beach condo needed a change too. 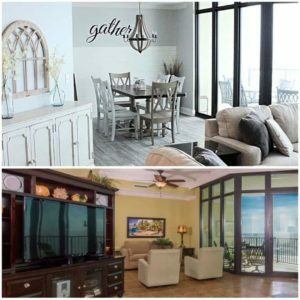 How DO you go from “Margaritaville” to a Coastal Farmhouse beach condo. 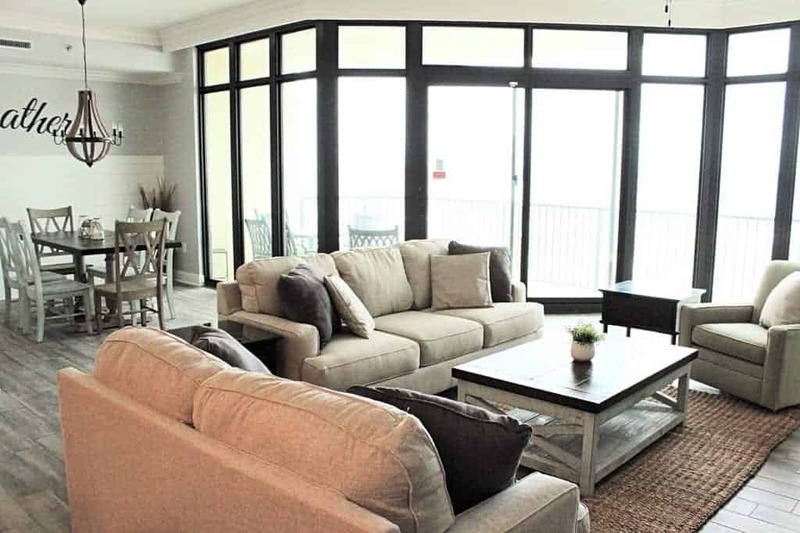 You can see the before and after transformation from a bright and heavy outdated space, to a serene coastal condo. My thought process with decorating this space can be summed up in two words: Coastal Farmhouse. 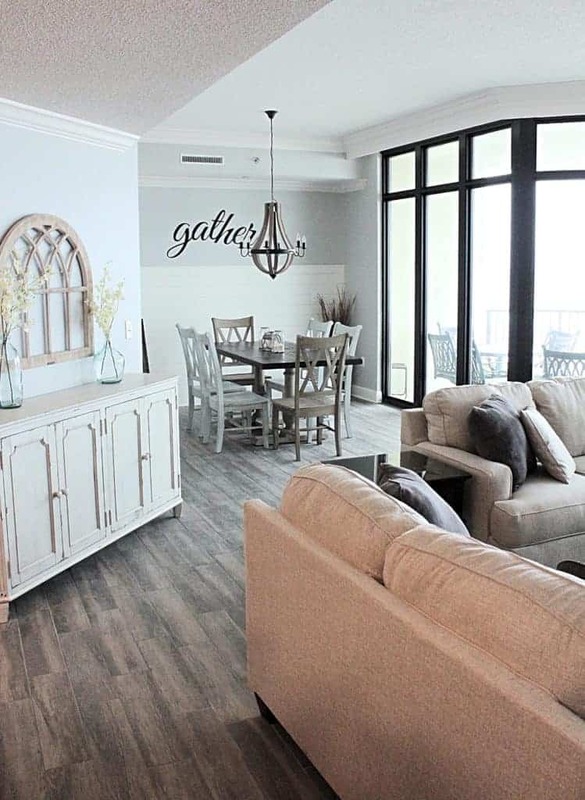 The owner loved the modern farmhouse style, but because it was a beach condo, I felt like we needed to lean more towards coastal colors. First, I chose a picture from Pinterest as my first piece of inspiration. It’s light, simple, and elegant. These adjectives, in my opinion, can also describe coastal farmhouse too. 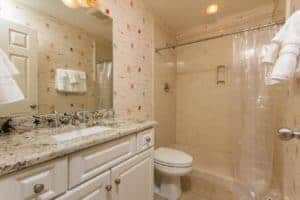 This space wasn’t terrible, just dated. It needed to be transformed from bold, dark and heavy, to soft, light and comfortable. 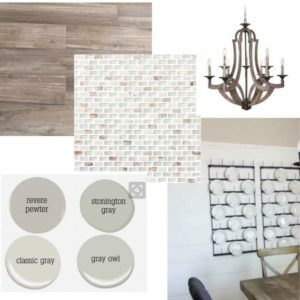 I wanted to create a serene coastal modern farmhouse style. There are a few key elements that needed to be changed: the floors, the lighting, and the paint. 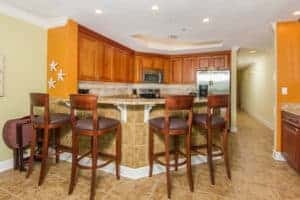 The first step in this makeover was removing the old tile and replacing it with a more “grayish beige” wood looking tile. After the flooring was removed, we chose our wall colors. 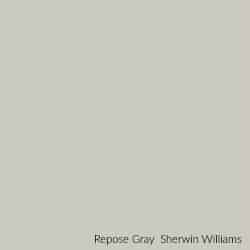 Repose gray (top color) was painted on all the walls except to the bathrooms. 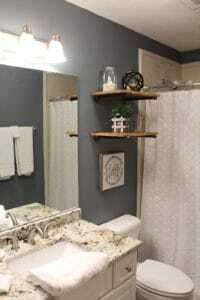 The middle color was painted on the master bathroom and the bottom color was painted to the remaining 3 bathrooms. 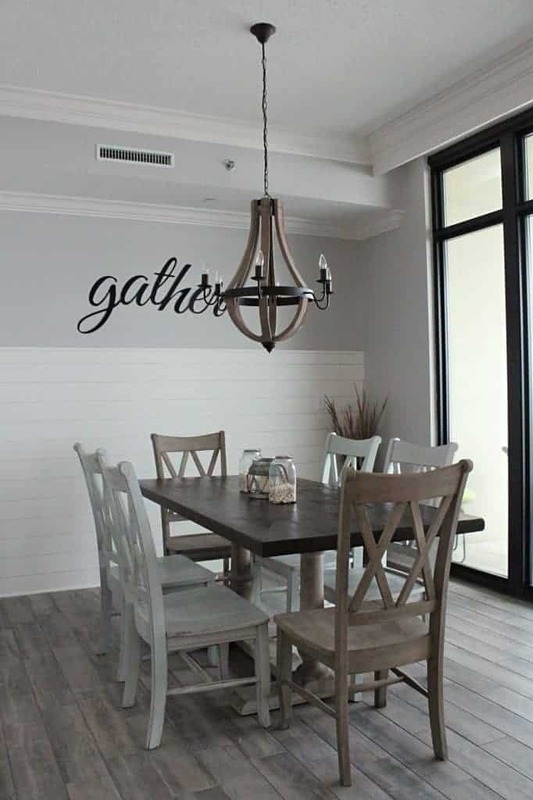 After paint and floors were done, our contractor installed the shiplap to the dining room wall and to the area below the tall countertop in the kitchen. Any sort of board on a wall always adds dimension. Quite frankly, who doesn’t love a little shiplap? 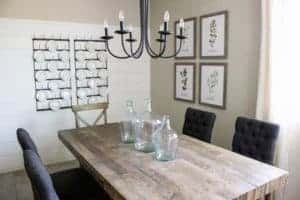 Speaking of shiplap, any kind of board and batten or wood planks always create a more coastal feel. I would love to know the reason behind this. Anyone know? The final step was all the finishing touches with a new chandelier, new furniture and accessories. We decided to carry the shiplap from the dining room to the area in the kitchen below the counter height bar area. 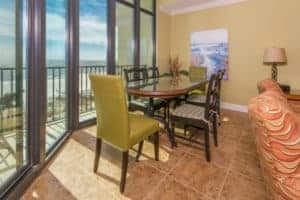 Rather than a dining area, we created a peaceful sitting area next to the large windows looking out at the gulf. Softening up the furniture, and moving the TV to this wall really created a clear “living room” area. 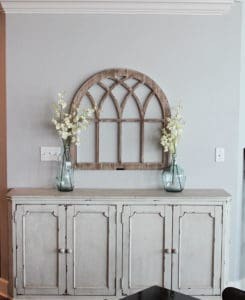 We removed the dark “TV armoire” and added this side buffet and a few accessories. Do you feel like you’ve stepped into a charming modern farmhouse coastal retreat? 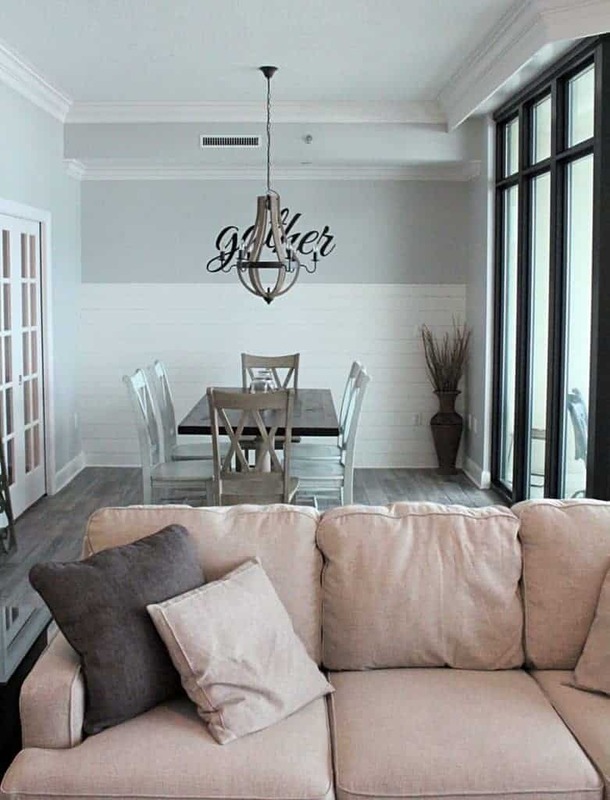 There seems to be a misconception that a beach condo has to have bright colors and palm trees everywhere, but I think soft hues with a modern farmhouse flair look just fine! Note: some of these link are affiliate links. This means that I make a small commission off of a purchase from a few of these links, but in no way does it affect the price you pay. Most accessories came from Hobby Lobby. Living room and dining room furniture was from a local store. 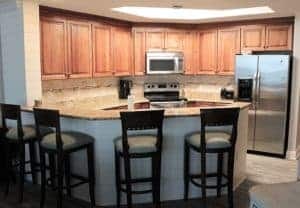 For more information about renting this beautiful condo in Orange Beach AL visit the site HERE. 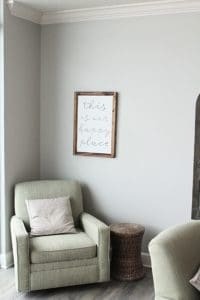 Thanks for stopping by and I hope you stick around to see more modern farmhouse style posts. YOU MADE THIS PEACEFUL …AS IT SHOULD BE ON THE COAST! BEAUTIFUL!!!! I love the newly updated space. What an incredible transformation Lindsey!! Such a lovely re-do. I do enjoy it both ways but think the farmhouse colors and styles go just beautifully too. 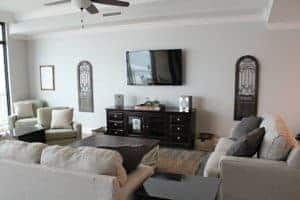 If I had a beach side condo I know all my rooms and colors would be sage, country blue, gray and tan with lots of white in it. I have a whole dream board on Pinterest for my dream beach house. I may just be adding a few of these photos to it! Thank you! Glad you’ve enjoyed the redo! Such a dramatic change! You make it sound so easy. This looks so peaceful and I love the color palette. Gorgeous! When can I rent it? LOL! I love the new look, it must have been a lot of work but the end result is amazing. Thank you for sharing at The Really Crafty Link Party this week, and happy new year. This is a gorgeous transformation! I love what you did! Thanks so much for sharing at the #happynowlinkup! What a fabulous transformation! It really does have a warm cozy feel. Thanks for sharing it with SYC. I’m sure it’s not intentional, but I’m not seeing a link back to the party. So gorgeous!! I am in love with your design! Thanks for sharing at Friday Frenzy Link Party! PINNED! I am not much of a formal person and likely would have done the same. Your space is gorgeous. What a beautiful transformation! I love that you moved the dining space for a sitting area to take advantage of the view. Excellent idea. 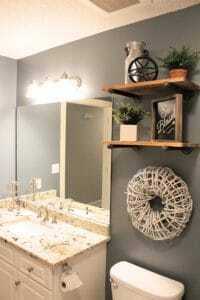 Lindsey, you’ve done an amazing job incorporating the farmhouse decor into your condo! You are my feature for this week’s Creative Circle link party. I would love for you to come share with us again! Love the new decor to the diggs! 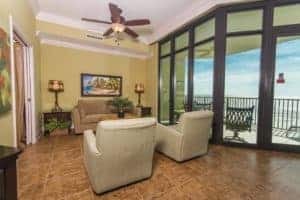 Such tranquil decor really makes the beach view take center stage! Thanks for sharing at Fridays Furniture Fix! This is just lovely! I love everything you did. Those windows are spectacular – would love to see what they look out on! I’ll be featuring your post at Best of The Weekend tomorrow night! Your transformation is amazing. I am so inspired. 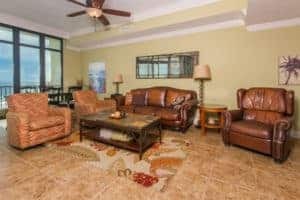 I’ve been looking at beach condos and have been so disillusioned with how dated so many of them are. You showed me how one of those dated condos could look with a bit of TLC. Thanks for sharing at Snickerdoodle and I am featuring you are the party this week. Thank you so much Sharon! It just takes a little vision to totally bring back an old space. Good luck on the beach condo hunt! Your place is beautiful! Not only that it is so comfortable and cozy looking. what a wonderful modern farmhouse. looks great.